Hammock chair stands are quite popular due to their versatile use in both indoor and outdoor setups. But finding the best hammock chair stand is not easy. There is countless chair stands for different purposes in different designs and sizes. And each year we see new brands pop up which makes our job even more difficult. But, we can help you find the perfect hammock chair stand for you. To make it easy for you we have selected the 5 best hammock chair stands in our review. These chair stands are very popular and do have good customer reviews. We have also sorted our best pick and budget pick. You can choose the one that fits your taste. We test the hammock chair stand in our lab. Then we check the authenticity and quality of the reviews before we recommend it. 4.1 Why do I want a hammock chair stand? 4.2 What to look at when buying a hammock chair stand? 5.1.2 Why Choose Hammaka Tripod Hanging Chair Stand? 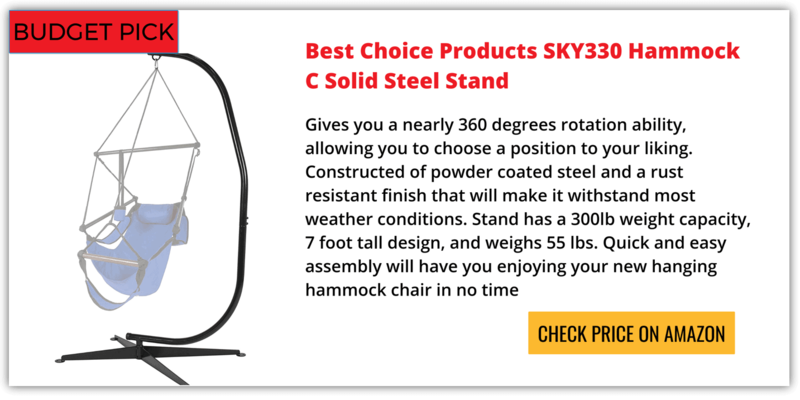 5.2.2 Why Choose ProSource Steel C- Frame Hammock Air Chair Stand? 5.3.2 Why Choose Hammaka Suelo Stand- Hanging Chair Stand? 5.4.2 Why Choose Best Choice Products Hammock Chair Stand? 5.5.2 Why Choose Zupapa Heavy Durable Steel C Hammock Chair Stand? Zupapa Steel C Hammock Frame Stand is our best pick. A good feature for a hammock chair stands is it should be portable. So you can relax in indoor and outdoor. This Zupapa stand is quite light in weight so you can carry it and place it anywhere you want. The hook and clasp of the chair stand are super strong and can carry up to a weight of 350 lbs. Many stands in the market do not carry so much weight. This is a unique feature of this hammock chair stand. The poles have a powder-coated finish. It is weather resistant so it can be used in all season without any rust issues. The X- shaped base of the hammock chair stand is very well designed. It can stand aligned and stable on any kind of surface, giving the user a feeling of security and ease. To avoid scratches on the floor it comes with a beautiful carpet as well. Zupapa Hammock Chair Stand is quite simple to assemble too. You can follow the guide for a quick assembly. This is one of the cheapest hammock chair stands in the market. But, the quality of the stand is very good. Best choice chair stand gives you a 360-degree rotation ability. So you can choose a position to your liking. This Chair stand comes with a rust-resistant coating. So you can use it outdoor for all season. It is 7 foot tall and can carry up to 300 lbs. The stand weighs around 55 lbs which is good to carry. You can place it anywhere you want. The strong base gives an excellent stability to this hammock chair stand. But, the stability of the stand is not great while comparing Zupapa chair stand. Why do I want a hammock chair stand? The right Hammock Chair Stand can help make any regular evening you spend on the porch a special experience. A lot of people like the idea of a hammock but don’t actually find them comfortable to sit or lie in. A hammock chair combines the best of both a porch swing and a hammock. It gives you a relaxing and pleasant experience. But why do I need a hammock chair stand? When you want to install a hammock chair in your backyard, but you don’t have the proper space, a hammock chair stand will do the trick. Even if you do have a tree or other support base available, many people still prefer to use a stand for their hammock. A stand provides you with a stable, durable support for your hammock or hanging chair. And the beauty is you can locate your hammock chair stand anywhere you like. With a stand, you can move your hammock chair as many times as you like. These stands are lightweight and easy to assemble. One day you can rest in the sun and the next day you can pick up your hammock chair and stand and put it on the front porch for a relaxing swing in the moonlight. If you love to read, but always have trouble finding that peaceful and relaxing place to do so, then a hammock chair and stand can be perfect for you. For artists, this can be a great place to practice sketching in the great outdoors or just in a well-lit room. You could do this with some other kind of chair, but the relaxing vibe of a great hammock chair adds a whole new level to release the creative flow. They’re also great for people suffering from any kind of a back pain since hammock chair conforms to the shape of your body. When you want to place your hammock next to the backyard pool, a stand comes in handy. It’s always a good idea to find a stand made of rust-free components when you plan to place your hammock near water, or in moist and humid climates. When you find high-quality hammocks and accessories you can turn your home into your very own tropical vacation spot. Even if you don’t get one for yourself, they’re great gifts for the outdoorsmen in the family, adding a touch of comfort to the rugged outdoors. When you use a stand, you don’t have the natural shading of the trees in your yard. But that is not a worry. A hammock chair stand may also include some sort of shade protection. It is called as canopy covers. When you want to sit in comfortable hammock chair without worrying about the damaging effects of the sun, it is a great option. What to look at when buying a hammock chair stand? There are several factors you must look for when buying a hammock chair stand. Generally, you have to buy your hammock chair and stand separately. So you’ll want to be sure that the two products you select are compatible. Many stands will claim to be compatible with any hammock chair. But, make sure that you’re buying a chair stand that will be the best fit for your hammock chair. You’ll also want to look at the stability and weight capacity the stand can withhold. This is one of the most important factors to consider. While most of the products in this category can withstand 300 lbs and more. Zupapa chair stand can hold more than 350 lbs. That is the highest capacity for the stands as of now. Choose a stand that will be able to stand up to the rigors of repeated use. You don’t want to be pushing the limits of your Hammock Chair Stand on a regular basis. So make sure your needs will be as far below the stand’s weight capacity as possible. We believe that will play a major role when you’re buying a hammock chair stand. Some brands like Zupapa hammock chair stand comes with lifetime warranty. When a company is offering lifetime warranty it shows the quality of the product. Without the confidence in their product, a company cannot offer such warranties. Always look for the higher warranty. Higher warranty = Higher confidence in the product. One good resource for researching a product is its reviews written by other customers. You can learn a lot about the products you’re thinking of buying by learning from others experiences. Of course, you always have to keep in mind that most products will have both good and bad reviews. That’s why the more reviews you read the better an idea you’ll have about which Hammock Chair Stand. Read more reviews on Amazon here. Most of the products are long lasting and reliable. Following are the top best hammock chair stand reviews in the descending order. The features along with the images are explained in each. Hammaka Tripod Hanging Chair Stand is a user favorite. Because of its amazing stability and versatility. It weighs only 10 pounds which is super portable. You can carry it anywhere. Material and Construction: This hammock stand is made up of aluminum, which gives it an ultra lightweight. Black aluminum coating powder gives an excellent look to the chair stand. Build and construction: The hammock stand has three retractable and reflective legs which form to be a shape of a tripod. This gives an excellent stability to this hammock chair stand. And three legs of the chair stand are retractable. Weight capacity: This hammock chair stand can carry up to a load of 350 lbs and provides extra strength. The dimensions of the hammock chair stand are 90” H X 57” W X 57” D.
The hammock chair stand is super light and weighs only 10 pounds, so you can carry it easily. Comfort: This stand can carry almost any type of hammock chair. Its design gives an appropriate swing to the chair. It also gives the hammock some extra space for proper stability and movement. Durability: It can carry a heavy load and is quite stable due to its three-legged design. It is an all-season product. Why Choose Hammaka Tripod Hanging Chair Stand? This lightweight and three-legged hammock chair stand is ideal for taking it to many places. If you’re a person who likes to carry the stand to many places, then this is a good option for you. A free carrying case is available with this hammock chair stand. It states it is a travel-friendly hammock chair stand. ProSource Steel Hammock Chair Stand is designed to give comfort to your lower back. It relieves stress on your spine by providing you the ideal position to relax. Being stylish and upping the essence of your yard, this chair stand is comfortable, durable and stable. Build and construction: This heavy-duty stand is made up of lightweight material. So it is portable. Rust resistant coating on the stand makes is durable in all weather. The C shape of the chair stand can fit any type of hammock chair. It helps release all the stress on your lower back and spine. Weight capacity: The C- shaped frame provides stability to the hammock chair. The hook can withstand heavy weights. This chair stand can work with any type of air hammock chair. It provides utmost strength and weight resistance with each type of hammock. Comfort: The X- shaped base of the stand provides extra stability and can stand on any type of surface. The design of this chair stand will relieve the tensions off your lower back. Hence it gives you a comfortable and stress-free experience. Durability: The metal construction provides a long-term durability and longevity. The heavy duty stand feature also adds to its durability factor. Why Choose ProSource Steel C- Frame Hammock Air Chair Stand? If you are seeking for durability and design then this hammock chair stand is noteworthy. The impressive feature of this chair stand is the design. It helps reduce your lower back pain. If you’ve any sort of back issues this hammock chair stand could be a good option. Hammaka Suelo Chair Stand is all about its light weight and comfort. It is compatible with any type of hammock chair. The design of the chair stand makes sure that your hammock faces proper movement and swing. The design and the curves provide extra space and hence better movement. Not only durable, strong and comfortable, this hammock chair stand is also portable. Build and construction: This hammock stand is made out of powder coated steel. That makes it quite strong and long-lasting. The powder coating also ensures that the hammock chair stand remains rust free for a long period. Like most of the hammock chair stand, this is also an all-weather use product. Weight capacity: The Hammaka Suelo Chair Stand can withhold any type of hammock chair. The maximum weight is 300 lbs. The stand weighs 52 lbs and measures 83” H x 34” W x 59” D.
Comfort: The curve gives extra space and ease of movement to the hammock chair. It also displays style and enhances your décor. The front wheel of the chair stand is adjustable according to the evenness of the surface area. That is one of the unique features in this chair stand. Durability: Made up of powder coated steel, the Hammaka Hanging Chair Stand is quite strong and durable. It is also coated with a rust-proof material which adds to its stability factor. Why Choose Hammaka Suelo Stand- Hanging Chair Stand? It is perfect for your indoor decor. It is compatible with any hammock chair. So you can choose a stylish hammock chair to attach. This will add beauty to your house. If you love to have the hammock chair stand inside your house, this is a better option for you. Another fantastic creation of Best Choice Products. When it comes to Best Hammock Chair Stand it has more reviews and rating when you compare to its competitors. Providing a great deal on the affordability factor, this hammock chair stand provides all the necessary features which make it a complete package. Build and construction: It is created using powder coated steel which provides strength and durability. It is also coated with a rust-resistant material which makes it an all-weather usable product. The design of the hammock stand allows any type of hammock to be used, and the C shape ensures further movement. Weight capacity: It can carry the weight 300 lbs. The weight of the hammock chair stand is 55 lbs. Comfort: The C- shape provides extra space and movement to the hammock chair. It provides almost 360-degree rotation, which is a rare feature to find in all hammock stands. The assembly for the hammock chair stand is quite simple as well. The stand provides extra stability and is quite strong. It can stand stable on any type of terrain. Durability: The steel material used for this stand gives extreme durability to the stand. Why Choose Best Choice Products Hammock Chair Stand? The Best Choice Products Hammock chair stand is a versatile product. You get everything you need on a hammock chair stand. The important highlight of this stand is its price. It is very cheap and affordable. This hammock chair stand is our budget pick in our best hammock chair stand reviews. If you’re looking for a hammock chair stand within your budget this can be a good option. Remember, the quality is not sacrificed for its price. Zupapa Hammock Chair Stand is the best hammock chair stand in the market at present. The design is compatible with any hammock. Stability, durability, portability, light weight, and versatility, there is everything in this hammock chair stand that you could ask for. Build and construction: This hammock stand is made up of durable steel. The durable steel is coated with a rust resistant powder. It is quite light in weight and hence can be carried wherever you want. The base of the chair stand is designed wisely to stay firm and stable even on rough terrain. The hooks which are fastened gives extra strength and carry a heavy load efficiently. Comfort: The C- shaped design provides extra space and an essence of style. It allows the hammock to swing freely, providing extreme comfort. It does not put pressure on your spine, thus relieving you of lower back pain. Weight capacity: It carries up to 350 lbs and is 83” in height. It measures 32″× 44″× 83″ and is 55 lbs in weight. 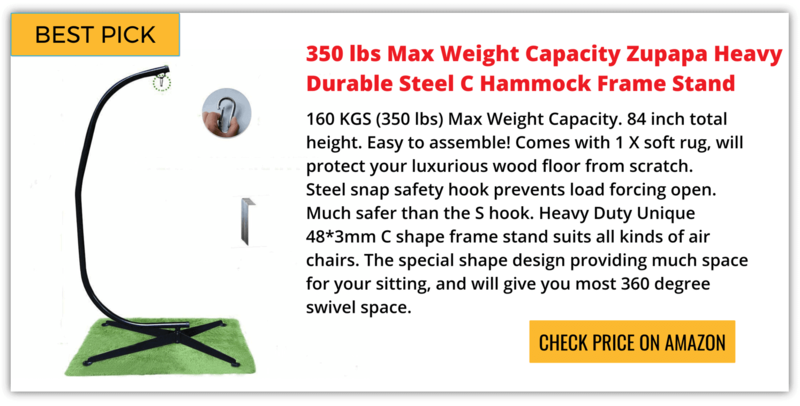 Durability: It also comes with a safety hook that provides more strength to the hammock chair. It comprises of an auto- close spring gate with an interlocking tooth for extra strength. The X- shaped base also provides additional stability on any type of surface. Why Choose Zupapa Heavy Durable Steel C Hammock Chair Stand? In short words, it provides all the features the other hammock chair stand has. It also provides additional features to it. Which makes this the best hammock chair stand in the market. As far as we researched, we could not find any problems with this stand. Moreover, the lifetime warranty on the stand makes the deal irresistible. We really hope that these best hammock chair stand reviews have given you a pretty clear picture of the features and individual specifications for each. If you have any query on this, you can get in touch with us through the mail. Don’t hesitate to come up with questions. Receive our thanks for spending your precious time and going through our hammock chair stand reviews.